When your physical safety is in danger, the most important thing to do is seek help. Fortunately, the state of California takes a very proactive approach to matters of domestic abuse so you have many options to protect yourself. Many families deal with domestic abuse situations at some point. Despite this, the process can be confusing navigating your options and seeking out legal representation. Whether you’re facing abuse or abuse allegations, it is important to meet with an experienced domestic violence lawyer in Orange County to understand your rights. What is domestic violence and do I need a domestic violence lawyer? Each state has different ways to define domestic violence. In the state of California, domestic violence includes bodily harm or attempted bodily harm including sexual attacks either deliberately or carelessly. Domestic violence in California also includes creating a fearful environment through body language or verbal threats. Even actions such as stalking, intimidation, or damaging property qualify as domestic violence in the state of California. Hence the name, domestic violence only includes people with whom you have some sort of domestic relationship. Remember, spouses are only one type of domestic relationship. Domestic violence also applies to cases including immediate family members, family members through marriage, and individuals you share a close relationship with through your living arrangement. If a judge rules that one or more of the above conditions have been met, they may seek legal options to protect the victim. When your physical safety is on the line, it’s important to understand the full scope of your legal rights. Meeting with one of the qualified domestic violence lawyers in Orange County is the first step to understanding your case. If you find yourself facing physical, emotional, or verbal domestic abuse, you have many options at your disposal to protect yourself. The state of California offers many different types of protective orders to keep you and your family safe from violence and abuse. Protective orders involve two parties: the restrained party and the protected party. The order places guidelines on the restricted party to limit or remove their contact with the protected party. The protected party may include multiple individuals such as a parent along with children. All protective orders have different levels of restrictions. Some may require the restricted party to move out of a home or prohibit phone and electronic contact with the protected party. The restricted party may also be forbidden from visiting a school or workplace. 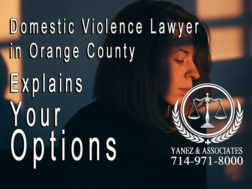 It is essential to meet with an experienced domestic violence lawyer in Orange County to understand your options and decide which route would work best for your particular case. Emergency protective orders are easy to initiate because they don’t involve a court ruling. You can simply call the police department with your case. They will immediately contact a judge who will grant the protective order and may force the restricted party to move. Police officers may request an EPO themselves upon responding to a domestic violence call. These protective orders are only meant to be temporary as you work out other options. Emergency protective orders go into effect after just 24 hours. However, they only last for one week. These protective orders take a little more effort than EPOs. You’ll need to file the proper paperwork and make a case to the judge. It is important to meet with an experienced domestic violence lawyer to make sure all your documents are in order. You’ll have to prove to the judge why this protective order should be granted. Temporary restraining orders only last between 20 and 25 days so make sure you explore other more permanent protection options with a domestic violence lawyer in Orange County during this time. When the temporary restraining order expires, you’ll have a court hearing. At this time, the courts will listen to both sides of the argument to decide if a permanent protective order is a necessary for your protection. Permanent protective orders last around three years. At the end of those three years, you may request another hearing to extend the order which the judge will review again. If the judge believes you are no longer in danger at this point, the order could simply expire. If the restricted party violates the protective order or physically harms you, you may be able to file criminal charges against them. The charges depend upon the criminal act they committed including physical assault. The restricted party could face jail time, probation, or other legal repercussions. Each case is unique and the ultimate decision is left up to the judge. What if you face allegations? Your accuser may easily file a temporary restraining order against you without your side of the story. It may not seem like a big deal if you don’t plan on seeing this person either way, but you should still meet with an attorney. Domestic violence accusations can impact background checks, employment, licensing, and many other aspects of your life. Personal protection orders can also affect custody arrangements and other legal proceedings. Meet with experienced domestic violence lawyers in Orange County today. Whether you’re facing abuse or you’re accused of abuse, it is important to understand your case and all of your legal options. You have a right to feel protected and safe. If you find yourself in a domestic violence situation, schedule an appointment with an experienced attorney. At Yanez & Associates, we can help you understand your options. We’re available 24/7 at 714-971-8000. Call us today for a free consultation.